The Stout House before re-roof. The Stout House was designed by architect John Spencer and built in 1890 for Frank D Stout, a lumber baron. The large home was split up into personal living space and business. Mr. Stout operated his business from the first floor which displayed the various wood flooring he sold. 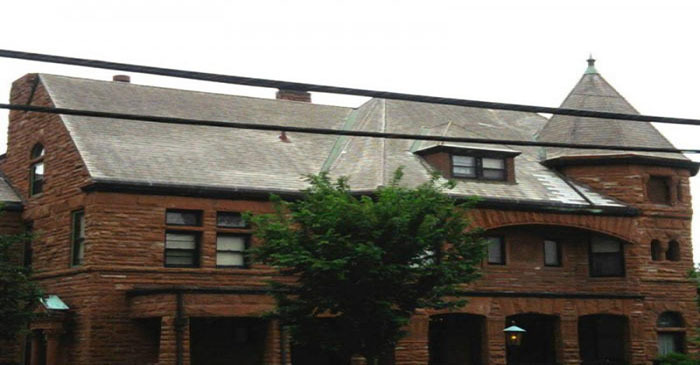 Stout House in Dubuque, Iowa selected North Country Unfading Black which exceeds ASTM requirements of an S-1 rated roofing slate. Roofing details include a saddle ridge and copper ridge cresting. This impressive red Minnesota sandstone home is 12365 square feet, has twenty-two rooms, eleven of which are bedrooms. With its semi-circular arches for doors and windows, thick walls, several columns, the home was a combination of various styles, but mostly characteristics of Richardsonian Romanesque architecture, which was a first in Dubuque. In 1911, the house was sold to the Catholic Archdioceses of Dubuque and remained a private residence of the archbishop up to 1985. It was then sold to the Dubuque Historic Improvement Company and became a bed and breakfast. The home was sold again in 1994 and again in 2008 and is now a private residence. Extensive external repairs were required to restore the home back to its original glory. Our North Country Unfading Black (18” x random width x ¼”) was supplied for the re-roof.